My everyday t-shirts and tank tops run true to size. I’m basing this on sizing from popular women’s fashion retailers like J.Crew, Gap, and Banana Republic. All styles are cut for women and are not boxy men’s shirts. If you generally wear a medium from stores like the ones mentioned above, then a medium in the everyday t-shirt and tank top will fit great! The vintage t-shirts RUN SMALL! Please see below. What’s the difference between the everyday t-shirt and the vintage t-shirt? The everyday t-shirt is a normal women’s t-shirt: true to size, medium weight cotton, flattering cut but not overly boxy or slim. It’s a great tee that works well on most body types. It’s not a men’s fit. Shop the Francophile design everyday t-shirts here and the Word Collection in the everyday fit here. The vintage t-shirt is a super soft, thinner t-shirt that is a slimmer cut and RUNS SMALL. Again, the vintage shirts RUN SMALL. It’s a little longer than the everyday t-shirt as well. You need to SIZE UP in the vintage t-shirt. Size up one size for it to fit how it’s intended — body-hugging fit. Size up 2 sizes if you want it a little looser. Keep in mind that this is a slim cut t-shirt so it won’t work for all body types even if you size up. If you don’t want the curves of your midsection to be accentuated, go for the everyday fit instead. Shop the Word Collection vintage t-shirts here. They are both fabulous t-shirts! Just depends on your style preferences. Tank tops are body skimming but not skin tight or overly baggy either. Order your regular size. Shop tank tops here. If you are between sizes, I’d recommend ordering the larger size. 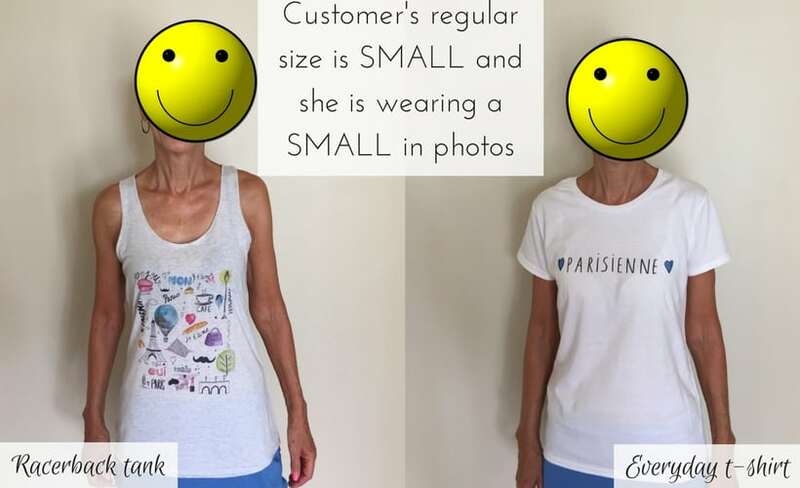 The customer above generally wears a small. 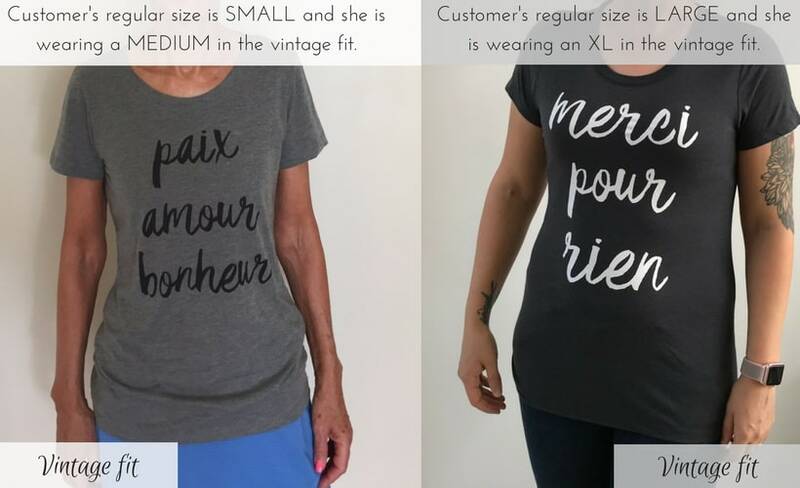 She is wearing the Francophile Scene tank top and the Parisienne Everyday t-shirt in her regular size, small, since these both fit true to size. The customers above are wearing the Word Collection t-shirts in the vintage fit, which RUNS SMALL. Shop the slim vintage fit Word t-shirts here and the looser everyday fit Word t-shirts here. The customer above is wearing the 2 true-to-size styles and normally wears a medium. 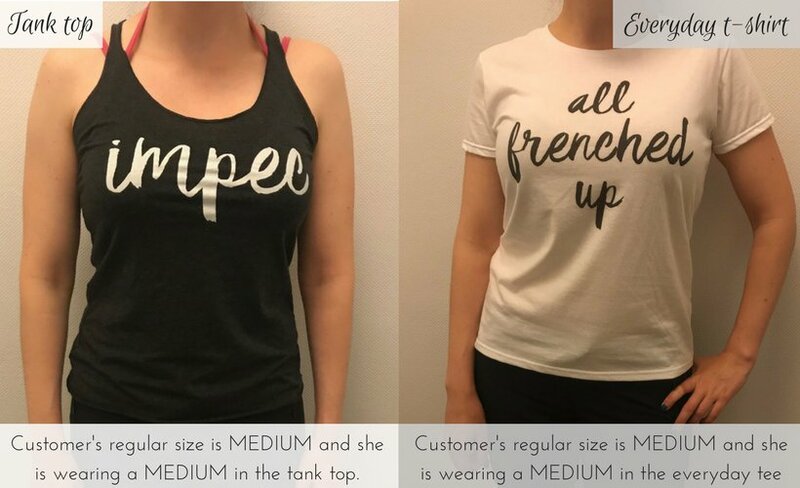 She bought a medium in both the Impec tank and the everyday t-shirt. I want you to be happy with your purchase and that’s why I’ve done my best to offer sizing advice (with the pictures above showing actual customers in my shirts). There’s also a sizing chart on each product page. Everything is printed custom as orders come in, so for that reason, I cannot accept returns/exchanges except in the case of damaged or defective items. ***Please be sure to check sizing information above before you place your order. *** I’ve made every effort to describe my shirts in detail to avoid sizing issues. Please email Diane at ouiinfrance@gmail.com for sizing help or to start the return/exchange process for defective/damaged items only. Please get in touch within 10 days of receiving your order. Returns sent to the fulfillment center directly will not be processed, so be sure to email me. Yes! Enter your address at checkout and be sure to hit update to see real-time shipping costs and transit times. Where will orders ship from? To help minimize shipping costs, orders delivered to customers in North America will be printed in the USA and ship from either California or North Carolina. I also have a Europe fulfillment center for my European customers (mugs and vintage t-shirts are only fulfilled in USA, though). Orders will be printed and shipped from the fulfillment center (either USA or Europe) that’s the closest in proximity to the customer. It’s reasonable. I promise! Shipping rates are custom calculated at the time of checkout and are dependent upon the order’s weight and shipping destination. Please be sure to put your shipping address and hit UPDATE at checkout to get accurate shipping costs. Recent customers in the USA have paid less than $5 total for an order of several t-shirts via regular mail. How long will orders take to ship? All orders are custom printed after the order comes in and the average fulfillment time (time it takes for order to be printed and packed before shipping) is 3 business days, although it can take up to 5 business days BEFORE ORDER IS SHIPPED. Thank you for your patience. The fulfillment centers are located in two US states: California and North Carolina. I am required by law to tax all orders shipped to California and North Carolina only. All other US states will not pay sales tax. For my customers located in the European Union (EU), VAT is already included for orders that are fulfilled at the Europe fulfillment center. Orders going to non-EU member states will not have a VAT charge. Do I have to pay customs fees or duties? International shipments may incur customs fees. The fee is usually based on a variety of factors like weight, value, and size, so please check your country’s policies. Customs fees are the buyers’ responsibility. Buyers in the USA will not incur customs fees because orders will be printed and shipped from within the USA. Hi, that would be me, Diane, an American who now calls France home. Nice to have you here! 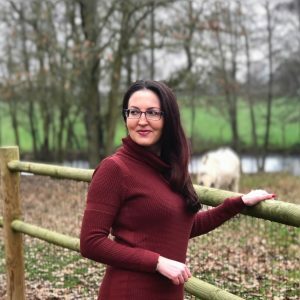 I’m also the creator of the site you’re on, Oui In France — a living abroad lifestyle blog. I hope you’ll check out my “About Me” page here (after you buy a shirt, of course). Who designed the items in your shop? So glad you asked! I did! The designs were inspired by some of my favorite things here in France including café culture and food. My ideas were conceptualized by a local French artist who brought my designs to life via a paintbrush and pen. Many of the designs feature watercolor. 100% authentically French. No clip art or stock images here! As of October 2017, I’ve added a new collection of word items that have some of my favorite French (or French-inspired) sayings that I thought would look pretty sweet on tees, etc. The shirts all use the DTG technique (direct to garment) printing and are custom printed as orders come in. The designs are printed into the fibers of the cotton and feel almost like a tattoo would on the skin. It’s extremely high quality and I think you’ll be very happy. I would love a variation that I don’t see currently offered — another color combo or style. Can you add it? Maybe! Contact me and I’ll take a look. Didn’t you have another shop before? What happened to that and can I still buy from it? Yes! When I first got started, I had a small shop hosted over on Big Cartel. Many of those items can be found on my new shop. You can read about why I’ve relaunched the shop here. Do you offer a discount if I’d like to order 5+ shirts? Please contact me and I’ll see what I can do. Have a question you don’t see here? Email me please!